Have You Ever Seen Spacecraft Solar Panels From Behind? I like very much the following behind-the-scenes photos the European Space Agency published on its blog and on its Facebook page. While ATV-4 is getting ready for launch on 5 June in Kourou, French Guiana, elsewhere in the world people are finishing ATV-5's components. 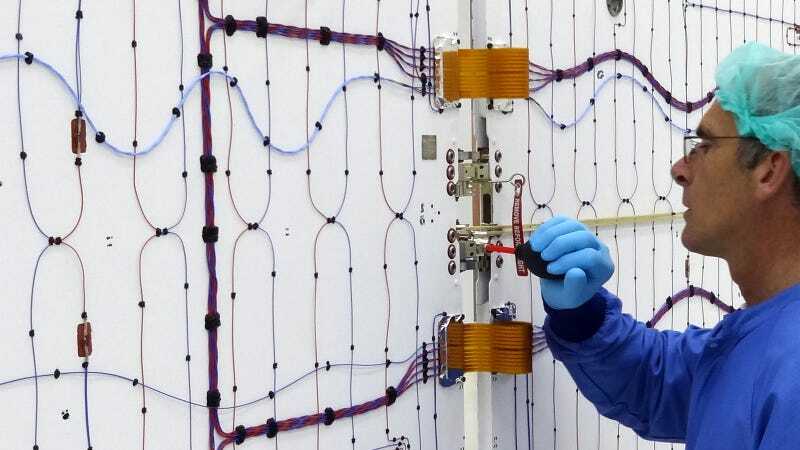 Here an engineer at Dutch Space is performing final checks on the hinges that deploy ATV's solar panels - or 'wings' as they are lovingly called at Dutch Space. This picture shows a rare view of a spacecraft's solar panels from behind, the side that does not point at the Sun and not covered in solar cells. This is one of ATV-5's solar panels as it will fly in space. It is not necessary to protect the cables other than fixing them in a wavy line to withstand physical stress during launch and deployment. As the solar panels are not meant to be opened up under Earthly gravity a special rig hung from the ceiling is needed to spread them out. Weights at the bottom keep everything in place. When inspection is finished, and all is perfect, the iconic "remove before flight" tags are attached and the solar panels are folded and prepared for transport to join the last ATV.